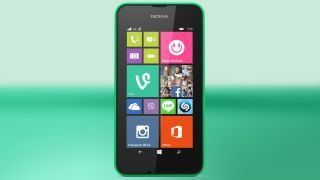 The Lumia 530 is here, so how does it compare? There's a new kid on the budget handset block in the form of the Nokia Lumia 530, so how does it compare with the other sub-£100 smartphones currently on the market? We've pitted the new Nokia against three of the top low-cost handsets around so you can see which budget blower is best for you. Price is key at the bottom end of the market and the Lumia 530 is being pegged at €85, which is around £70. The 4G enabled EE Kestrel is the priciest in this comparison at £99 on PAYG, while the Motorola Moto E carries a PAYG price tag of £80 and the Vodafone Smart 4 Mini is a steal at just £50. When it comes to design there's no getting away from the fact that all four handsets are plastic clad, but that's fine considering the price point. The EE Kestrel is the most svelte at just 7.85mm thick, making the Lumia 530 (11.7mm), Smart 4 Mini (12.3mm) and Moto E (12.3mm) look decidedly chubby. None of the quartet break any new ground in terms of smartphone design, with all four providing functional layouts which allows you to get the job done without any of the thrills. If you're looking for a phone which isn't going to weigh you down at all you'll want to check out the 117g Smart 4 Mini or 129g Lumia 530. The Moto E is heavier at 142g, while the larger (in height and width) Kestrel tops the bill at 145g. The Nokia Lumia 530 inherits the same size screen from is predecessor, sporting a 4-inch display with a mediocre 480 x 854 (245ppi) resolution. That puts the 530 just above the 4-inch, 480 x 800 Vodafone Smart 4 Mini (233ppi), while the Moto E glides in with a 4.3-inch display and a more impressive 540 x 960 resolution. The biggest screen on show is the 4.5-inch offering on the EE Kestrel, although its 540 x 960 resolution gives it a slightly lower pixel density (245ppi) than the Motorola Moto E (256ppi). The Nokia Lumia 530 has had a power boost over the Lumia 520 it's replacing, with the processor under the hood being bumped from a dual-core offering to a 1.2GHz quad-core Snapdragon 200 chip with 512MB of RAM. That's the same chip series as you'll find in the Moto E, but the Motorola offering only has the dual-core version, making it less powerful - but it has more RAM at 1GB. Another handset languishing with a dual-core chipset is the Smart 4 Mini which packs a 1.3GHz MediaTek processor alongside 512MB of RAM. The EE Kestrel is the closet to the Nokia Lumia 530 with a 1.2GHz quad-core Qualcomm chip, but it has the slightly more advanced Snapdragon 400 model backed up with a full 1GB of RAM.